…this is where it started. The earliest known possessor of Sorbie, the land where the Hannay tower house stands, were the Viponts, a powerful family of Norman origins. They are recorded as Lords of Westmoreland who received the lands and manor of Sorbie in 1185. A mound or “motte” on the property is all that remains of their physical tenure. During this period, the name A’Hannay began to emerge in the records, eventually supplanting the Viponts (see What’s In a Name?, right). Like the other native Galloway clans, such as the McDowalls and McCullochs, the Hannays supported John Balliol, who by his mother the Lady Devorgilla, represented the old Celtic Lords of Galloway against Bruce, but in 1308 were forced to submit to Edward Bruce when he conquered Galloway. The first recorded Hannay is Gilbert de Sowerby, who witnessed a charter in 1328 though a Gilbert de Hannethe (possibly his father) signed the Ragmans Roll in 1296 when Edward I of England made the feudal Lords and Chiefs of Scotland swear allegience to him at Berwick. This period saw the end of an era in the fortunes of the Hannay family, as inter-clan feuding drained the resources of the lairds of Sorbie and the tower house was eventually sold into the hands of the Stewart family. Many family members moved to Ireland and from thence to the New World. For those who remained in Galloway, from the early 18th century onward, the main line of descent of the old chieftains were centered around Kirkdale, Our current chief, Dr. David Hannay, traces his lineage through this branch. In 1960, a small group Hannays, Hannas and Hannahs from around the world met in Edinburgh to found the Clan Hannay Society. The first General Meeting of the Clan Hannay Society was held in London in 1962, and in 1965, Mrs. Jean Cummings, the then-owner of the land around Sorbie Tower generously gave the tower and its immediate surroundings to the Society. It is now held in trust for the benefit of family members throughout the world. 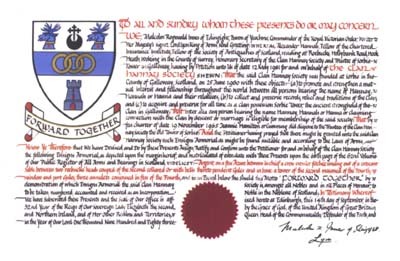 In 1983 a Grant of Arms was made by the Lord Lyon to the Clan. Continuing over a half-century tradition, Gatherings are still held yearly at Sorbie Tower, accompanied with activities for visiting Clan members from around the world. Whether you’re a Hannay, a Hanna, a Hannah or a Hanney, you most likely can trace your name back to family variously known as A’Hannay or A’Hanna living the little village of Sorbie in Southwestern Scotland at least as early as the 12th century. Stewart Francis, in his book The Hannays of Sorbie speculates that HANN may be a place name and that the suffix, spelled in whatever way, represents the old word for “island”. Exactly when and how the Hannays or Ahannas, as the name was formerly spelt, succeeded the Viponts is a matter of conjecture as the records of the 13th Century are very sparse. But the similarity of mottos, Viponts–“per Aspera ad Alta”, Ahannas–“Per Ardua ad Alta”, suggest that succession could have been a peaceable one as by marriage. as well as Hannahs, Hannas and Hannays of note. Memories and Stories from individual Clan families around the world. Clan Hannay Forum members on Facebook!